The Algonquian-speaking natives used the Potomac primarily as a food source. In various seasons, they harvested anadromous fish, crabs, oysters, and migratory birds like geese and ducks. The edges of the rivers were rimmed with villages, when John Smith sailed to Little Falls near the modern-day Chain Bridge in 1608. The river was a transportation corridor for Powhatan's towns, though the Native Americans in Virginia never accomplished ocean-going voyages across the Atlantic. Their travels did extend to the Eastern Shore, and canoes of fish and corn must have traveled regularly down the Potomac for pre-colonial trade. Still, with only about 15,000 people stretched from the Potomac to the Albermarle/Pamico Sound, the pre-colonial Native American population density was thin. The Potomac was not a transportation corridor of major significance during the early English settlements, though John Smith explored it upstream to Little Falls (near modern-day Rosslyn/Georgetown) in 1608. It took almost a century after Jamestown was settled in 1607 for English plantations to be established near the Fall Line of the Potomac River. After 1607, colonial Virginia plantations were established first on the James and York rivers. Early land grants placed "hundreds" of new settlers along the James, then crept north to the York and the Rappahannock. In 1632 Maryland was created as a separate colony, with a Catholic proprietor. At one point Lord Calvert even claimed that today's Potomac Creek was the main stem of the Potomac, and thus the southern border of Maryland extended south to near modern-day Fredericksburg. The Northern Neck grant by Charles II further clouded the title to land between the Rappahannock and the Potomac after 1660, resulting in a higher percentage of indentured servants settling that area. The frontier nature of the watershed upstream of Aquia Creek was reflected in tension between Catholics, Protestants, and remnant bands of Native Americans. The lack of effective government in the region was demonstrated during Bacon's Rebellion in 1676 and Parson Waugh's "tumult" in 1689. English explorers crossed into the Shenandoah Valley and into the New River Valley by the 1670's. However, English settlement in Virginia did not push upstream across the Fall Line until the 1700's. Governor Spotswood led his "Knights of the Golden Horseshoe" up the Rappahanock River (his personal focus of speculation) to the Shenandoah River in 1716. Spotswood was not exploring for a mythical Northern Passage or to purchase furs for trading; he was loooking for land to buy and sell. Settlement west of the Blue Ridge occurred first near the Potomac River than further south - but not because of traffic coming up the river. Ocean-going ships reached Alexandria and Georgetown, but the Fall Line (Little Falls and Great Falls) blocked those ships from sailing west towards the Blue Ridge. The Pennsylvania "Dutch" migrating west and south of Philadelphia brought new titheables into Virginia from the north. To them, the Potomac River was a barrier to be crossed at fords, a minor barrier to travel rather than a transportation pathway. They crossed the river and walked up the Shenandoah Valley. Not surprisingly, immigrants that crossed the Potomac River from the north settled on the first flat, fertile, near water...) that they encountered. Frederick County accumulated a sufficient number of citizens to become established as a political unit independent of Orange County in 1743. Augusta County, just to the south, required an additional two years before it could be organized. 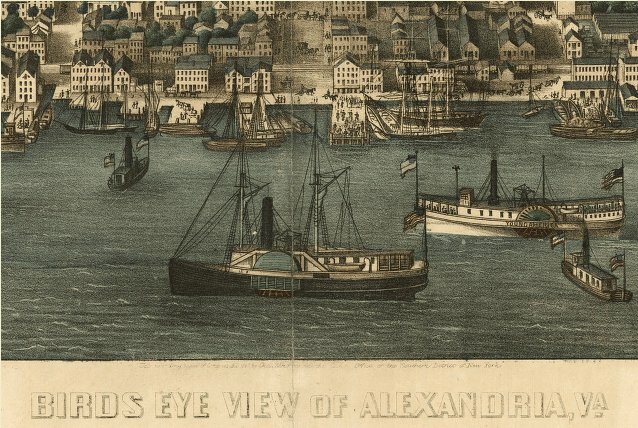 Alexandria was the deepwater port furthest upstream on the Potomac. Georgetown was shallower, and was used more by coastal trading vessels rather than ocean-going ships carrying crops to England. Alexandria merchants sought to attract the farm trade to their area (in competition with Georgetown, Occoquan, Dumfries, and Fredericksburg) as settlement filled the Piedmont between the Fall Line and the Blue Ridge. Little of that trade came down the Potomac. The river was frozen in the winter, flooded in the spring, and too shallow in the late summer and fall when crops were harvested and ready to be shipped. Still, it was clear to forward-looking politicians in both Alexandria and Williamsburg that the Potomac River had the potential to become a major transportation corridor between the Atlantic and the Ohio River backcountry. Thus the physical geography of Northern Virginia provided the opportunity for George Washington to become recognized initially. In 1753 Lord Dinwiddie, the colonial governor residing in Williamsburg, recognized that the French plans to build forts in the Ohio Valley would isolate Virginia from the interior of the continent. If the French could establish effective control from Quebec to New Orleans, the future expansion of English settlement would be prohibited - and Lord Dinwiddie's economic speculation in western land grants would be worthless. Washington was chosen to deliver the demand from Dinwiddie in November, 1753 that the French withdraw from the Forks of the Ohio (today's Pittsburgh). After the French rejected Dinwiddie's demand, Washington was ordered back to the region with the Virginia Regiment in 1754. His "assassination" of the French diplomat spurred the French and Indian War, the first world war, and led to England gaining control of Canada and India. Why was the English government in London willing to risk an international conflict over Virginia's claims to the Ohio River valley? The international rivalry between France and England shifted regularly between cold and hot wars - but perhaps more to the point for a class on Virginia geography, why would the colonial governor in Virginia and the General Assembly push the Ohio River issue? Cheap lands were scarce in the Virginia colony by Dinwiddie's time. The gentry gained great wealth by using their access and political clout to purchase western lands at a low cost, then selling them for a substantial profit later, after immigrants began to settle the area and the demand for land escalated. Normally the edge of settlement (the "frontier") was the best place to acquire lands cheaply and resell them 10-15 years later. In the 1750's, the Blue Ridge and Shenandoah Valley were the edge of settlement in Northern Virginia. However, the unsettled areas along the Potomac River were controlled by Lord Fairfax. After his survey of the land grant from Charles II had been upheld by the Privy Council in London, the land speculators had to leapfrog further west and lay claim to lands in the Ohio River drainage. The General Assembly and the colonial governor could make it difficult at times for Lord Fairfax to control those lands fully, but the gentry (other than Fairfax and his agents) could not make any profit on that 5.2 million acre land grant. So why didn't the colonial elite then speculate on the lands in southwestern Pennsylvania, just across the river and outside Lord Fairfax's grant? To some extent, Virginians did. The new Commonwealth of Virginia even chartered Yohogania County between 1776-1786 to support those claims, before Virginia finally ceded its rights to western lands. But it was the lands along the main stem of the Ohio River and the flat country to the west that were most attractive, albeit further away from the Atlantic Coast. In an agricultural economy, the rich bottomlands were far more valuable than the forested Appalachian hillsides. Pennsylvania was not the only target of speculation. The Loyal Land Company sought lands in Kentucky and triggered conflicts with the Native Americans, while the Ohio Land Company triggered conflict with the French. To Washington and others anticipating future growth of Virginia, access to the Ohio country was essential. They anticipated the day when farmers in that watershed would need a market for exporting their products. If the Potomac River could be improved to facilitate water-born commerce to the Ohio, then migration of settlers westward would strengthen rather than weaken the existing colonial economy. Washington understood the drainages; he even fell into the Allegheny River in the winter of 1753 and nearly froze to death. He recognized the natural outlet for trade from the Ohio farms would be downstream to New Orleans, rather than across the mountains to the cities like Philadelphia, Baltimore, and Alexandria. But he also understood that if the English could establish their claims effectively to the trans-Allegheny, then the English could build transportation improvements to draw the trade to the Atlantic Ocean. The remnants of that navigation project to bypass Great Falls can still be seen at Great Falls park on the Virginia side, in the locks still visible on the south bank and in the land platted by "Light Horse Harry" Lee to develop into the town of Matildaville. On the Maryland side, you can see the locks of the later, more-successful Chesapeake and Ohio (C&O) canal started 40 years later, in 1825. Pennsylvania also invested heavily in a competing system, the Main Line Canal, but in the end it was the Erie Canal that drew most of the interior trade to New York City. After the Erie Canal was completed and the western trade went to New York, Alexandria was relegated to being a regional rather than an international transportation center. So what role did the Potomac play in shaping the initial development of Northern Virginia? However, the evolution of Northern Virginia owes more to an individual than to the physical geography. Perhaps more than any other factor, it was the vision and personality of George Washington that led to the Northern Virginia area becoming a political center. Since World War 1 in particular, Northern Virginia's growth has been fueled by its proximity to the national capital rather than its physical advantages as a transportation center. George Washington led the military effort to create the United States of America, then he led the political effort to create one nation from the feuding states, and finally he selected the exact location of the national capital.